Shop online for 40 pontos plastic models at discounts up to 46%. This is the 1/200 Scale USS Missouri BB63 1945 Wood Tone Deck & Detail Set for Trumpeter. This Detail Set is from Pontos Models. This is the 1/350 Scale USS Missouri BB63 Type 2 Wood Deck for Tamiya. This Detail Set is from Pontos Models. This is the 1/350 Scale HMS Hood Type 1 Wood Deck w/Photo-Etch for Trumpeter. This Detail Set is from Pontos Models. 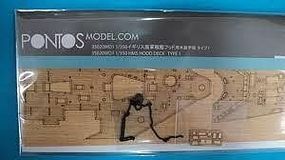 This is the 1/200 Scale USS Missouri BB63 1945 Wood Deck for TSM Plastic Model Ship Accessory by Pontos. This is the 1/350 Scale IJN Yamato 1945 Wood Deck for Tamiya. This Detail Set is from Pontos Models. This is the 1/350 Scale DKM Prinz Eugen Type 1 Wood Deck for Trumpeter. This Detail Set is from Pontos Models. This is the 1/350 Scale USS North Carolina BB55 Blue Tone Wood Deck for Trumpeter. This Detail Set is from Pontos Models. 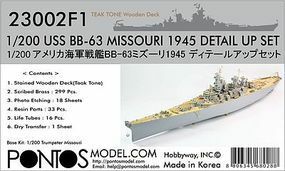 This is the 1/200 Scale USS Missouri BB63 1945 Blue Tone Deck & Detail Set for Trumpeter. This Detail Set is from Pontos Models. This is the 1/350 Scale USS Yorktown CV10 1944 Detail Set for Trumpeter. This Detail Set is from Pontos Models. 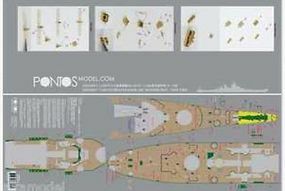 This is the 1/200 Scale HMS Nelson Detail Set for TSM Plastic Model Ship Accessory by Pontos. This is the 1/350 Scale USS Indianapolis CA35 1945 Detail Set for Academy and Trumpeter models. This Detail Set is from Pontos Models. This is the 1/350 Scale HMS Dreadnought 1907 Detail Set for Zveda. This Detail Set is from Pontos Models. This is the 1/350 Scale USS Ticonderoga CV14 1944 Detail Set for Trumpeter. This Detail Set is from Pontos Models. This is the 1/350 Scale HMS Warspite 1943 Wood Deck w/Photo-Etch for Academy. This Detail Set is from Pontos Models. This is the 1/200 Scale USS Iowa BB61 1944 Wood Deck for TSM Plastic Model Ship Accessory by Pontos. This is the 1/350 Scale DKM Bismarck Type R Wood Deck for Revell. This Detail Set is from Pontos Models. 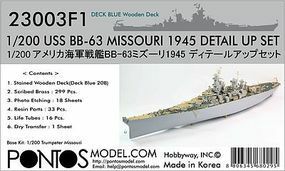 This is the 1/200 Scale USS Missouri BB63 1945 Blue Tone Wood Deck for TSM Plastic Model Ship Accessory by Pontos. This is the 1/350 Scale IJN Yamato 1945 Detail Set for Tamiya. This Detail Set is from Pontos Models. This is the 1/200 Scale USS Missouri BB63 1945 Detail Set for Trumpeter. This Detail Set is from Pontos Models. This is the 1/350 Scale USS Alabama BB60 Blue Tone Wood Deck for Trumpeter. This Detail Set is from Pontos Models.